David de Gea's Brilliant Reply When Thierry Henry Asked "Can United Stop City?" 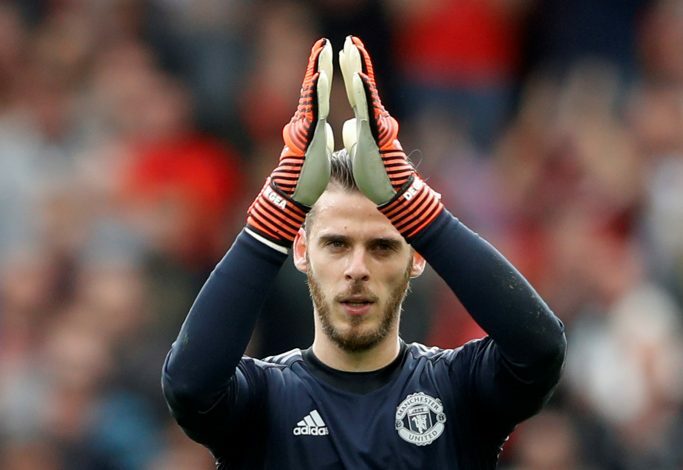 Manchester United goalkeeper David de Gea is in tremendous form at the moment, and the player is upbeat ahead of the derby showdown with Manchester City on Sunday. The Spaniard No. 1 made an outstanding 14 saves in his side’s 3-1 win against Arsenal at the Emirates last week and is expected to make a difference against a free-flowing City side as well. City are eight points ahead of 2nd-placed United in the Premier League table, and the hosts are in need of a significant win to pull the plugs on Pep Guardiola’s side. An enthralling battle is on the cards at Old Trafford, with the history of rivalry set to be seen once again when Jose Mourinho and Guardiola grace the field. United are physically stronger than their rivals, and De Gea’s presence adds a vital factor to give them hope in slowing down the Blue half of Manchester. The Spaniard has maintained the maximum clean sheets in the Premier League this season, and will be presented with a challenge against the likes of Sergio Aguero and Kevin de Bruyne. The former Atletico Madrid keeper then went on to back his side, which has been picking up points on the road, and has won all of their last three games in the Premier League. “The team is in a good moment, we won two difficult away games so we have confidence and we know we play an important game. We really want to win,” the shot-stopper added.